Whoever said the fishing season is over on September 1st obviously doesn't know about Sooke's year-round fishing possibilities. Once the returning chinook and coho have passed through in August to October, there remains a solid fishery for "winter springs", the resident chinook salmon that spend the winter in local waters. They are smaller than the big prize fish of summer, but they are packed full of oil and make for fantastic "barbecue" fish or smoking. You can find them from the Bluffs to Otter Point right on the bottom....magic depth often 130 feet. Bounce that downrigger ball to make sure you're on the bottom. Glow hootchies and spoons are the most common lures. 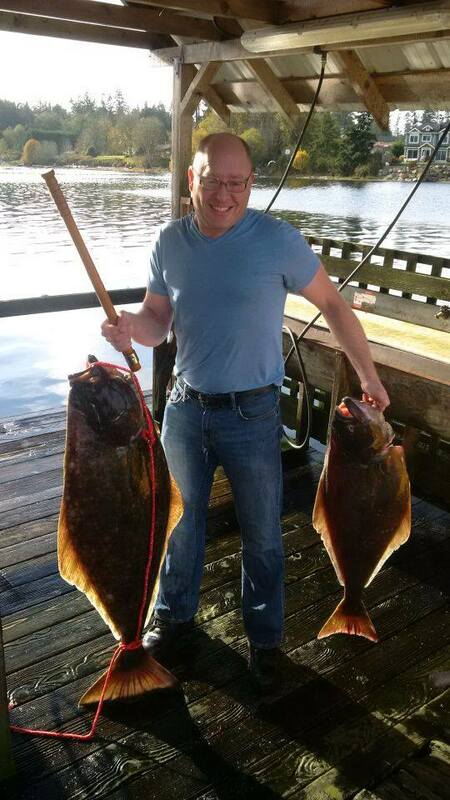 And the good news this year is the halibut fishery has once again been left open to December 31st. Lots of reports of good catches coming from those willing to dodge the storms. They are being caught from the Bluffs to points west, both on the drift and on anchor. 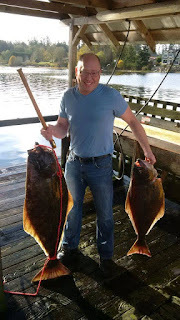 Here's Darcy with the first halibut caught on his "new" boat ... what's the expression about even blind squirrels finding some nuts? Just kidding....way to go Darcy, that's quite a few fish n chips dinners there! So, if you want to catch some fish, don't be putting that boat away for winter just yet. Get out there! But make sure you watch the weather and play safe!